Some studio paintings, and William Turnbull. I shall have to make efforts not to rant here. Arts documentaries nearly always get my goat. One on William Turnbull had me foaming at the mouth even more than usual. It was in the standard format lingering shots drifting over the art with evocative music setting the mood. Then series of talking heads with all the usual suspects saying how golly gosh darn good he was. It was more of a eulogy than a documentary. The man himself drivelled on about how he came from working class roots and name checked the artists he met in Paris. All of which desperately ignored the fact that his work was to a large degree boring and derivative of other artists who’s work he struggled to make arid emulations of. His early spindly Giacometti phase was especially risible. The fragments of badly made Paolozzi were a giggle too. He did in essence do everything that was needed to fit in with his contemporaries. The art establishment loved him for it and apparently still does. All the words were wheeled out: magisterial, towering, ageless, absolute integrity etc. Other artists etc popped up and made a quick curtsey, Anthony Gormley, the supremely irritating establishment flunky Matthew Collings and finally the sainted Serota himself. Meanwhile on the screen there were dodgy knock offs of Barnett Newmans with added splodges of colour in one of the fields that looked as if he had thrown a brush at the thing in despair. What infuriated me most was the ritual genuflection to “drawing”. There was a shot which the man himself was shown reverently sorting through his own works of genius. We were quickly reassured that drawing didn’t mean just rendering what might be in front of you, oh no that isn’t drawing. Drawing is a mystical communion with the purest creative spirits, Matthew Collings popped up and told us that drawing from anything in a representational manner was just making a cartoon of the world. He meant cartoon in the Disney meaning of the word not the classical. The genius himself popped up in the early stages and reassured us as to his love of the life room. I’ll put one of his effort below, you had best hold on lest you be blasted from your seat by his raw talent. He apparently worked as a youth for DC Thompson… what as we wonder tea boy? Well that puts Michelangelo in his place doesn’t it! 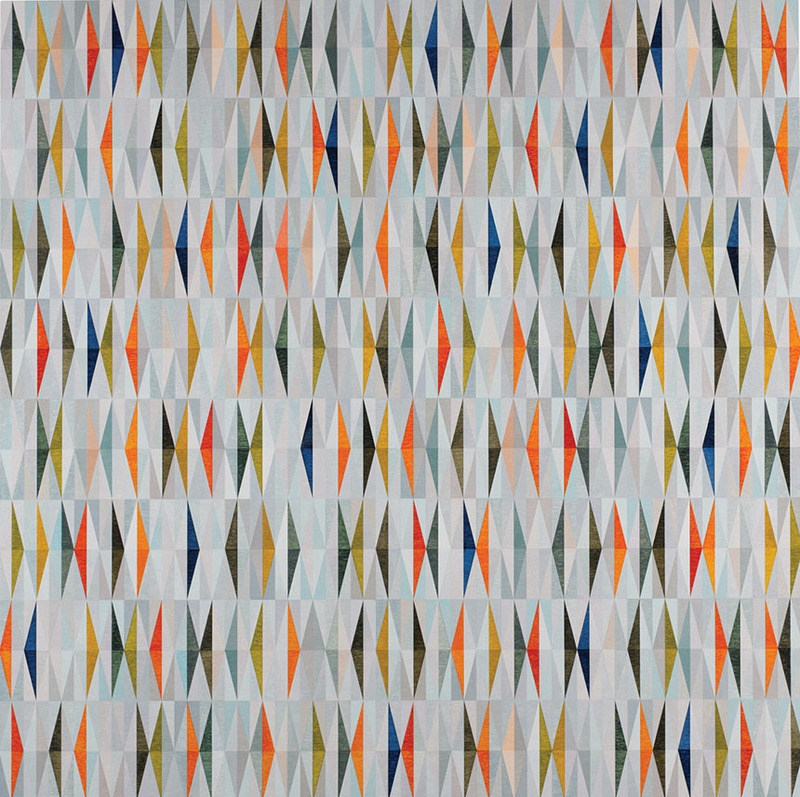 Would it be unkind to say that it is just as well he stuck to abstraction? We were then patronised by Matthew Collings again, who told us that abstraction was just too “hard” for most people. No Matthew we understand it fine, it’s mostly just a bit dry and boring and rather too easy to do well enough to just about pass muster. Here is one of Matthew’s efforts done with the help of his partner Emma Biggs. They can’t draw or paint, but hey lets not let that hold us back! Anyway he can talk for England which is far more important. Matthew said, “We think about visual ideas — colour and tone, and formal arrangement as a metaphor for the material world.” Emma rules all the lines and mixes the paint while Matthew does the masking and filling in. Well done Emma and Matthew! It will make lovely table cloth. Back to the mean and moody Turnbull. He had an apparent fondness for having himself photographed in film noir black and white lurking by one of his sculptures. He is a handsome devil no doubt and I’m sure he had all the ladies aquiver in art college. I don’t actually dislike his abstract work. Most of it is inoffensively pleasant. The sculptures are adequately Hepworthy when he does Hepworth and when he does female forms he puts twee little apple like bosoms on them like other sculptors and tribal chaps do. He does a nice line in polite redefinitions of primitive figures in the ancient Mediterranean manner that would look the part in any garden. The paintings are polite scaled down versions of the American abstract expressionists, sadly though they are all better at it than he is. He died last year at the age of 90 odd, so it is plainly the time for beatification. I’m sure they will succeed Turnbull is supremely innocuous and presses all the right art historical buttons. Indeed he is the epitome, one might almost say a compilation of approved art establishment styles, if he didn’t exist they would have to have invented him, which for most practical purposes it seems to be more or less what they did. I have just read the reviews in the papers, not one of them does anything much else other than paraphrase the the documentary, the Independent blames the shrubbery at Chatsworth for the out door exhibition of sculptures blending in with them, which seems unfair! On to more pleasant matters though. I have been trying to get some studio work done. I have been trying a new approach , which is to work on a set of 4 or 5 paintings at a time and maybe reworking old stuff. This means I can work at a painting for an hour or two and then set it aside and do some on another then returning to each a few days later when some drying has taken place. After a bit I have found it is quite an effective way of working. One of the big plus points is that when working away at one you can turn and consider another. Because the cunning old brain is full of the painting to hand you suddenly see yesterday’s one in a new light and a way of improving it leaps to mind. It also seems to help with overworking as you don’t get carried away with less important factors and can keep the bigger picture, as it were, to the fore. So here is the first batch! This is a reworking or more like a finishing off of a picture painted last year. It is in the City of London near Mansion House. I reworked the tones from left to right so that the flow of light was more unified and generally richer. Below is how it got left for a year nearly. As the picture was dry I could glaze broadly to enrich the colour without effecting the underlying brush work. 24in by 18in Oil on canvas. The old version looks very palid! 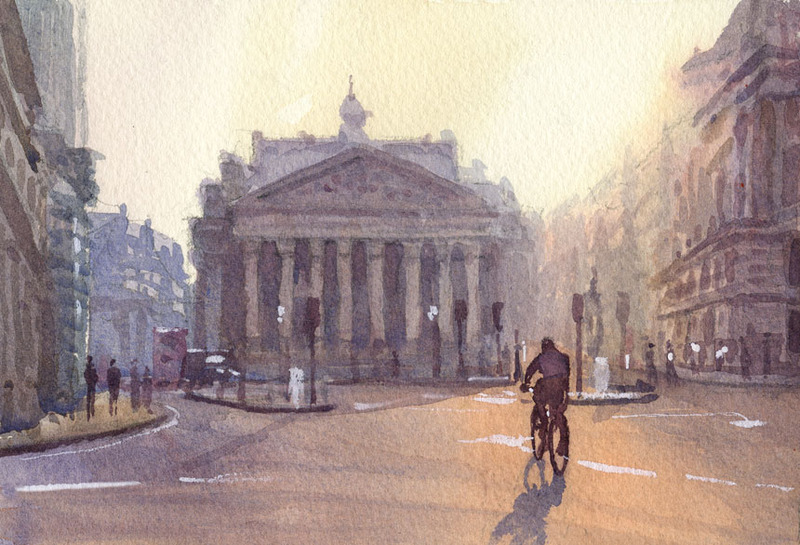 This is the Royal Exchange, I have painted this many times. 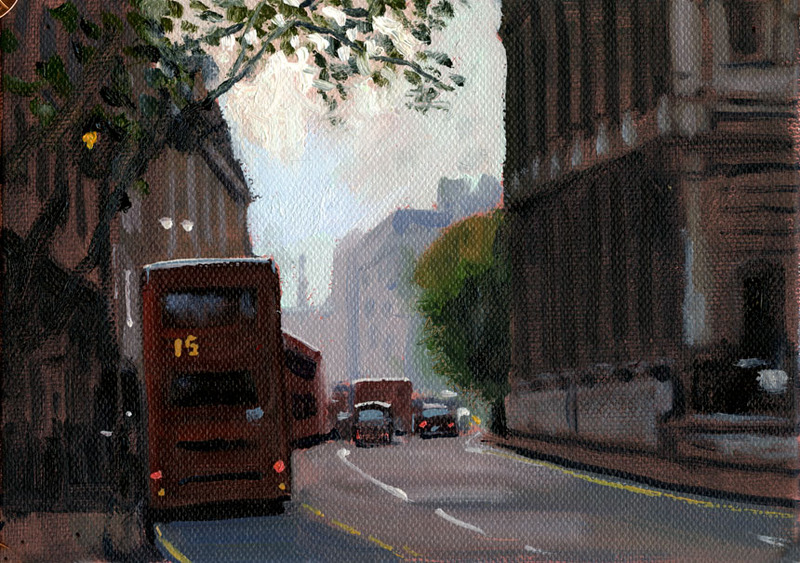 It was based on a very quick plein air done early one morning on the way to a client. The little sketch had a magic I wanted to catch. I decided to alter the mood to winter but other than that I let myself be guided by the sketch. I went up and photographed again and also I had some snaps of traffic and cyclists taken on the day of the sketch. All together quite a lot of information to glue together. 36in by 18in oil on canvas. Here is the wee 5in by 7in sketch. I really tried hard to keep the feel of this. This is Charing Cross station. All from photo ref this one no chance of setting up an easel here! 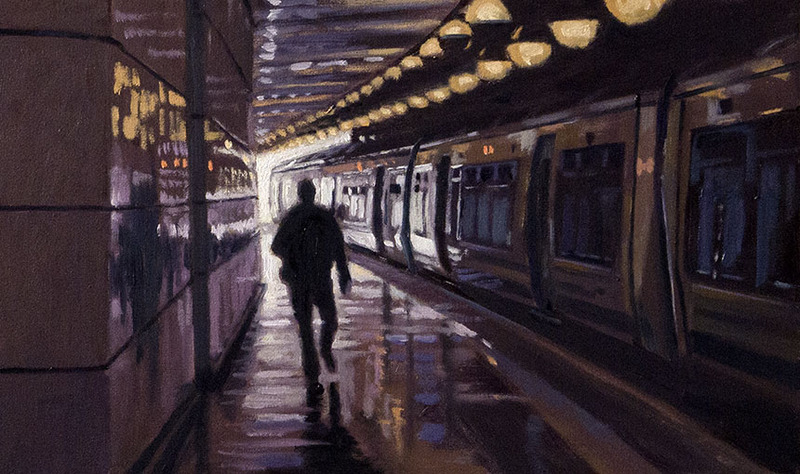 I have done a few of these, there is something fascinating about railway stations both in the rush hour and in quieter moments. Not quite finished but needs to dry before glazing. Another one from a plein air sketch. 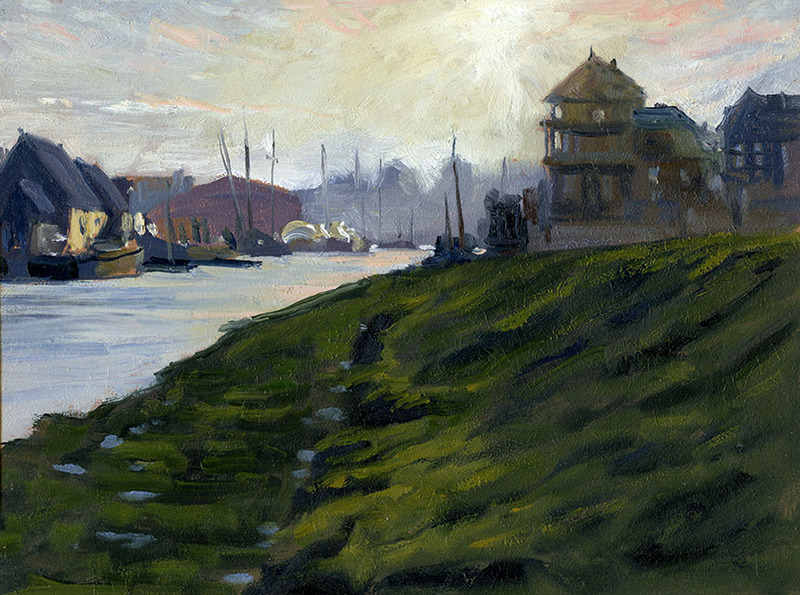 I am really pleased to be getting some work done from plein air sketches that keeps the mood. It is something that has always seemed to elude me but I seem to have found the beginnings of a way forward. 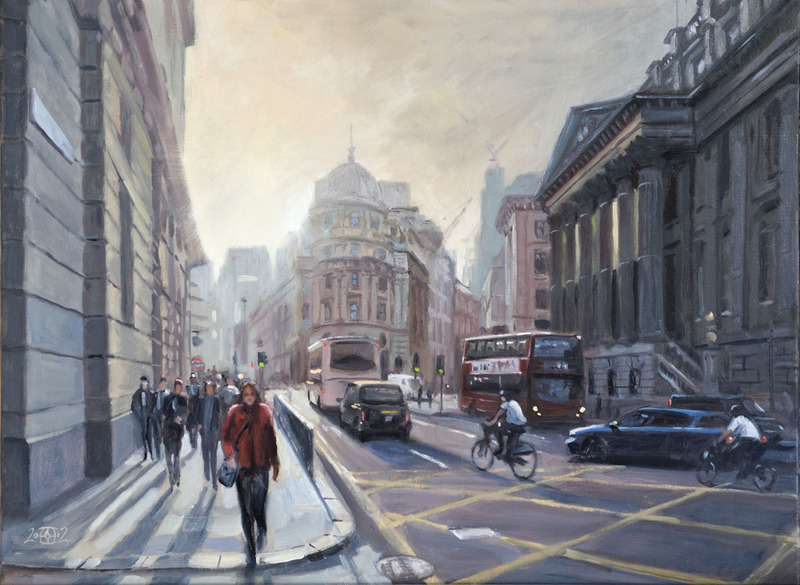 This is Mary Le Strand looking up the Strand towards Charing Cross. 24in by 18in oil on canvas. Lastly here is the original sketch that is a tiny 5in by 7in painted standing holding my wee pochade. Surely there is only one way? Well, perhaps not. I have written a little about how we see in various posts, but not as much about what we choose to see. This is prompted by discussions on Wetcanvas where I posted an inspirational drawings thread recently. Inspirational Drawings The fact that the subject matter was constrained rather pointed up the variety of approaches. It and other threads also showed that people for the most part thought their own particular way was the more correct/valid one! As I tend to do myself of course! It is quite hard to break down the various approaches, on the one hand there could be the Photographic/Realist/Impressionistic view and perhaps an Abstracted/Expressionistic view might at the other. Or it could be the difference between, what I “saw/perceived” and what I “thought/felt” about whatever subject. Obviously works at the extremes are rare, most will have elements of both. Academic drawing for example has a large amount of observation, but also a considerable degree of analysis in attempting to understand and demonstrate the form to the viewer. The result is that not a great deal is left to the imagination and subtle changes of tone are pumped up to bring out underlying structure. Knowledge of anatomy and formal methods of describing form are brought to bear. It tends at the end of the day to deliver a rather idealised view. Proponents are often very focused on the technicalities of the act of drawing rather than the response it might elicit in the viewer. The impressionistic approach is in essence just observing patches of tone or colour and getting them more or less in the right place and relationship. Any structure or form is a mostly bi-product of this simple process and does not need to be expressly defined or delineated. As I remarked before a photograph does this by merely registering the values and recording them. A pointillist for example might build up the image in dashes of colour with the figure and surroundings treated completely equally. 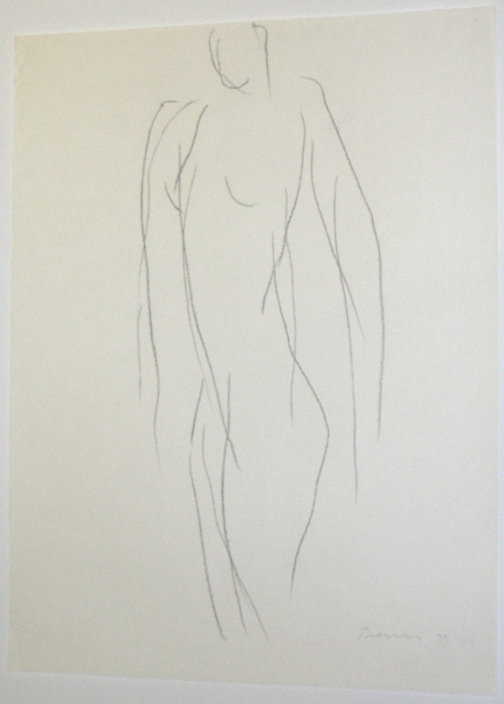 The viewers automatic recognition of the human form supplies the focus of attention. Both these approaches are I feel perhaps a little narrow and not very intellectually or emotionally sophisticated, but as they do indeed often produce beautiful things maybe sophistication is not always a requirement. I am ruminating on this as I am immured in the studio doing some larger paintings. Which is going unaccountably well, I have finally come to terms with working on a set of oil paintings rather than a single one at a time. For practical reasons alone this is necessary due to drying times. It also brings some dividends in getting a good result. It actually helps a great deal with seeing what needs and does not need doing on a painting. Although becoming involved in the act of painting is great, it can lead to a painting going off track because you cannot distance your self from the developing painting. It is that distance that allows you to cry “Enough!” and stop before you kill it by over working. Only one in this post however as I am waiting for a day when the day is bright enough to photograph them. The other thing I am doing a little more is revisiting older paintings. Previously it was a very rare event for me to revisit a painting that had been set aside as complete. Even though I can often see things that could easily improve it. To some degree I suppose I have the feeling that they represent a particular time and to add anything later would confuse the linear history of my work. However I don’t see why this should be true, so I have been over working some things from the last couple of years that didn’t quite make the grade. Strangely the process is quite fun. You are working over something where the work is mostly done, at the fun stage really. There is always the risk of ruining what has already been done but no fatalities as yet. 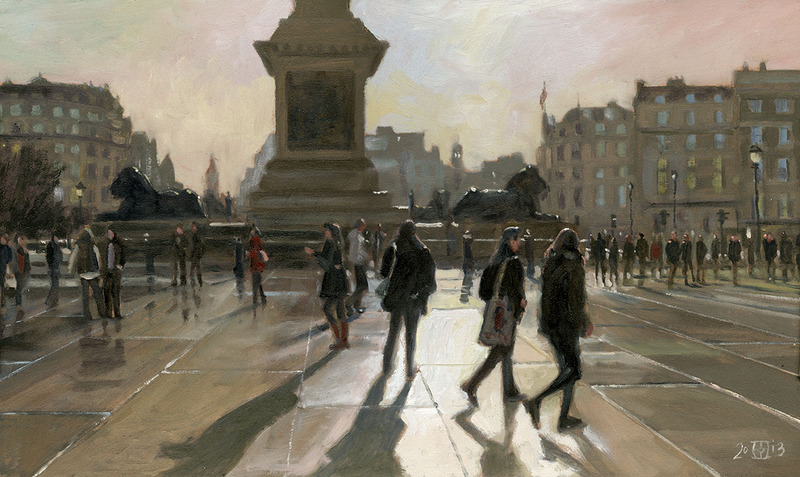 This is Trafalgar Square in a moment of magical lighting. I did a very quick lay in on site after a mission to buy paint. Getting it all in was hopeless so I deliberately just tried to get the basics in place. I took many photos of the passers by so that I would have plenty of reference. The main thing I wanted to nail was the blaze of light on the paving as that was what set the scene for me. 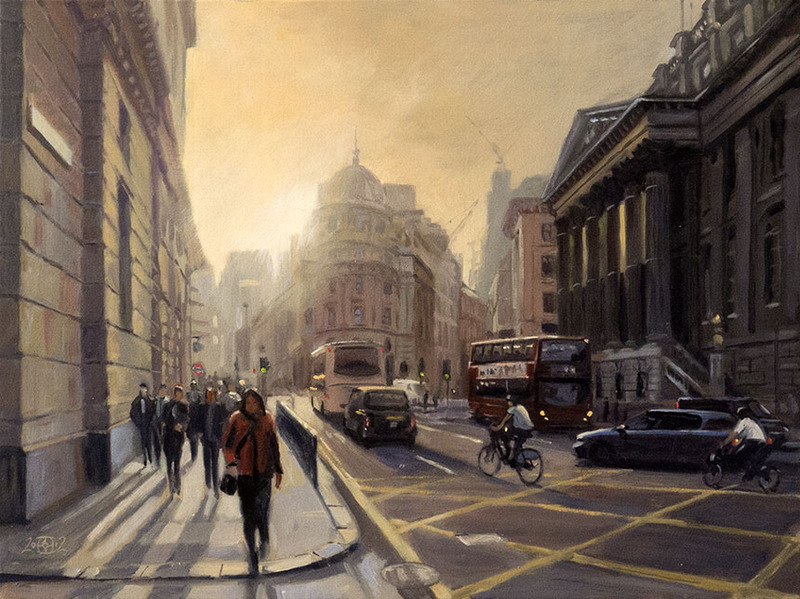 I also had the idea to use foreground figures to describe the flow of light, the problem with this is that the figures will dominate so they would have to be carefully chosen. Next day I adjusted the photos in photoshop to have as much of the tonality and colour of my block out as possible. Then readjusted to how I would “like” it to be. The result was nor quite what I wanted but looked very promising, so on the next fine afternoon I went back do try to pull the thing together on site. 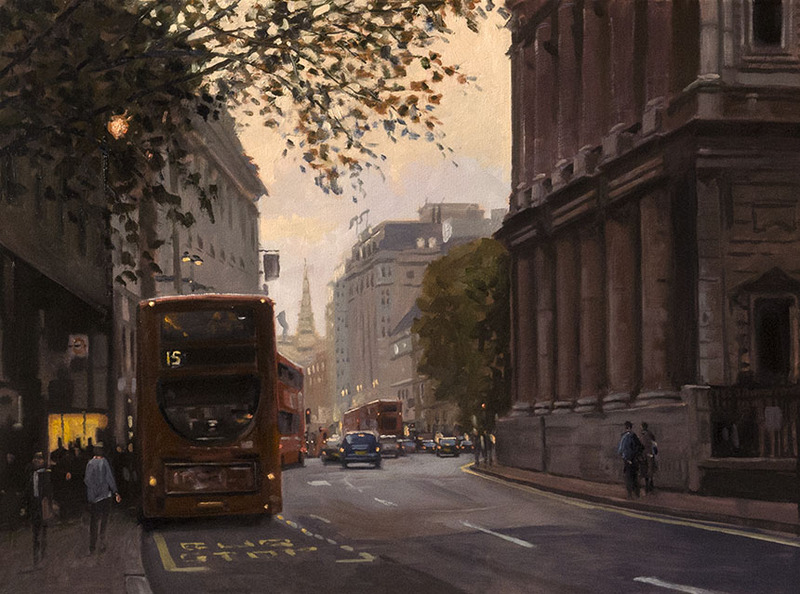 I was so lucky that the light was far better than my first visit, it had rained a little which lifted the pavement and there was a slight haze that pushed the far side of the square back. 40 mins rather rushed work completely lifted the feel of the picture. All I did after that session had dried enough was to tidy up and unify the handling. 17in by 10in oil on board. 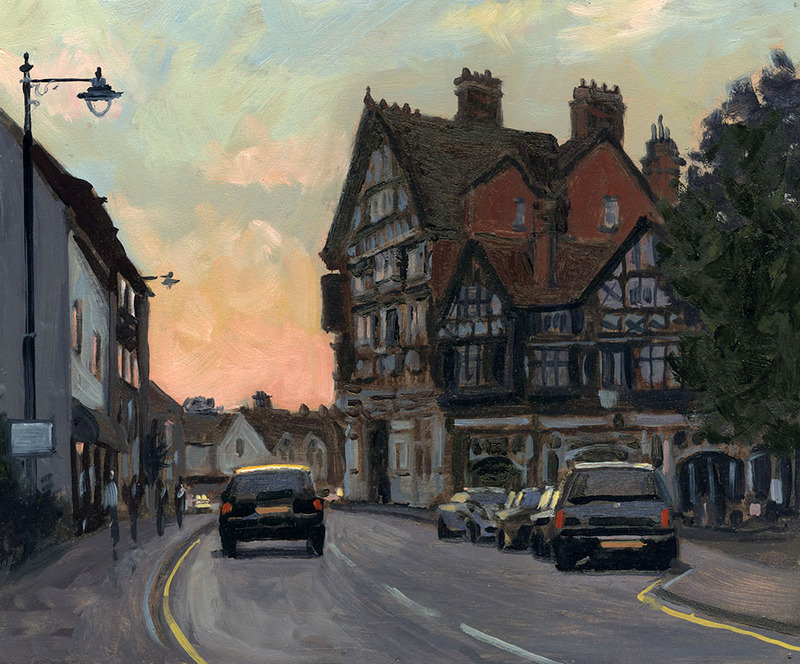 This is a finished off plein air of Henley. Prompted by my recent visit I dug this out which was just a set of silhouetted shapes. I spent a pleasant hour finishing it off. 12in by 10in oils. An outing with the Brass Monkeys in Rotherhithe. 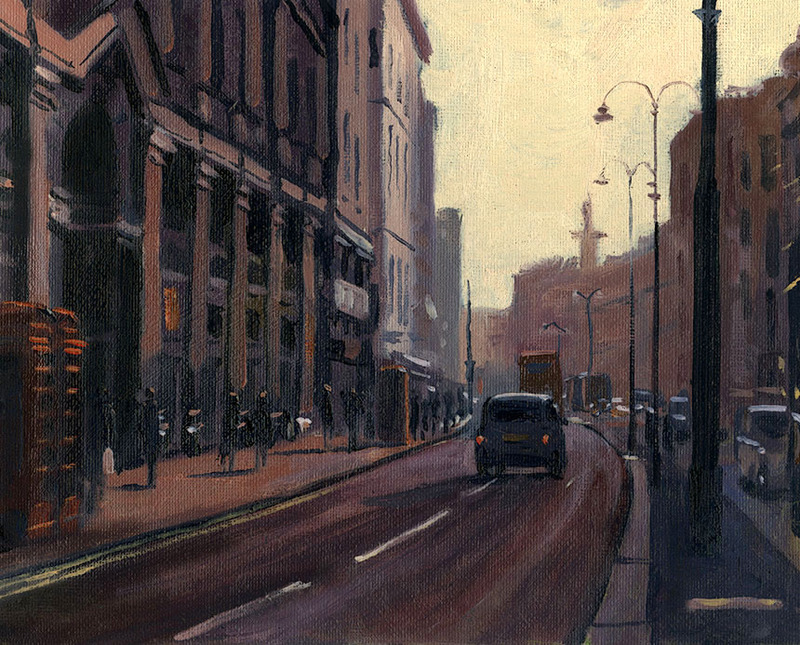 An absolutely gorgeous day and Tony Lawman and myself painted away while the going was good. 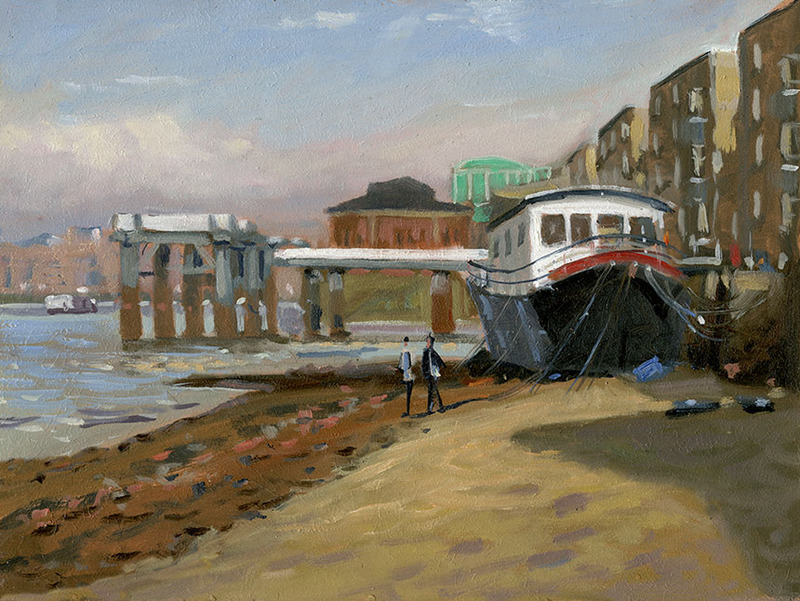 The tide was low allowing access to the foreshore of the river. I probably should have used a bigger board but might well do a larger oil from this. 10in by 8in. This is the view from the other way. I would have done another as the light was getting fantastic, but I had folks coming to dinner! 10in by 8in oils. 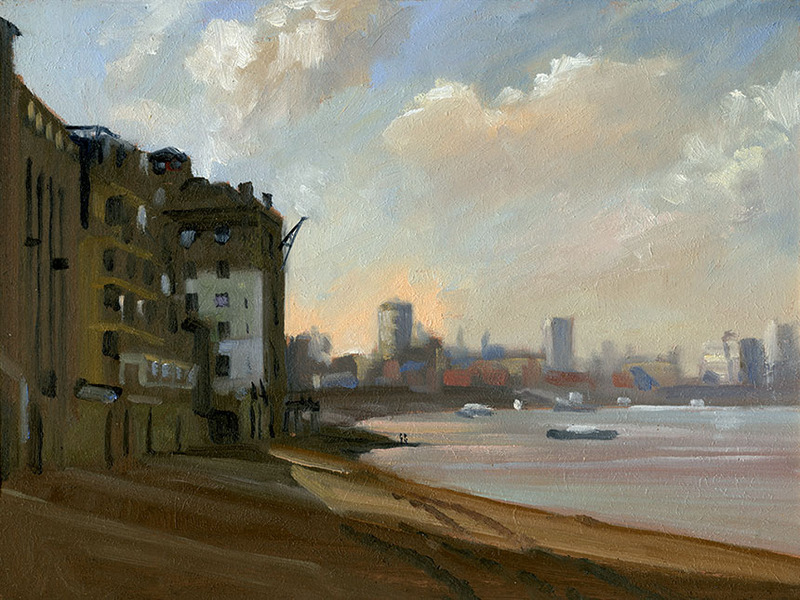 This one has appeared before but it is of Rotherhithe again. I saw this view as we were leaving the previous day, so when the next evening looked good I popped back as it is near to me. This was such an easy picture to paint the light at that time of day reduces everything to simple forms. I spent more time mixing the tones than I did smearing the stuff on the board! 12in by 6in. Another Brass Monkey day. 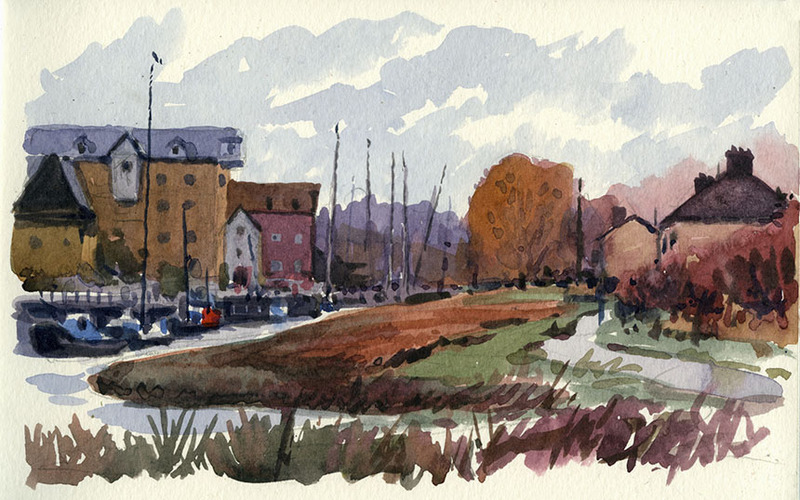 This is Faversham Creek a favourite haunt for daubers. The weather forecast had been flat and grey so this was an unexpected treat! The foregound needs something on it a lobster pot or some such as the eye tends to drop off the bottom of the picture. Something more substantial than a shadow anyhow. 12in by 10in oils. 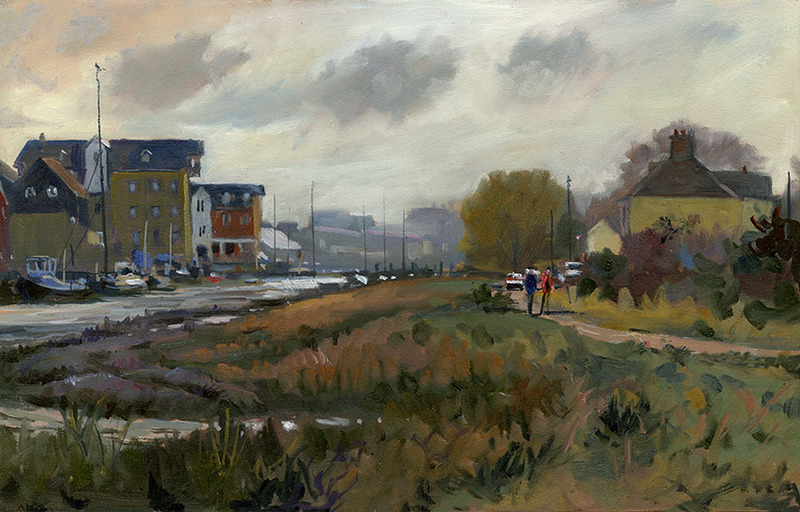 Another up Faversham Creek, we painted this in a group which is always very pleasant. There was at least an hour of companionable silence as we painted away! 16in by 10in oils. The same scene but a water colour sketch from earlier in the day. 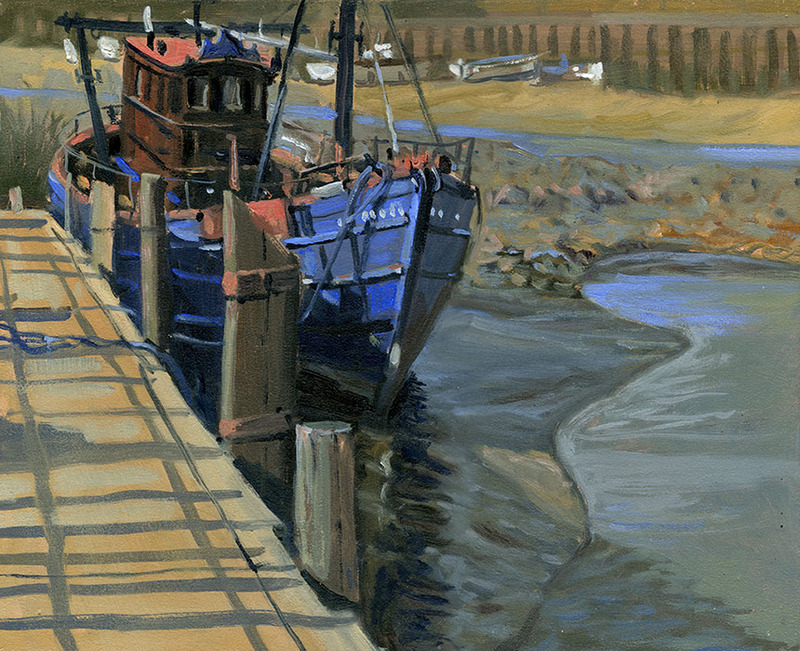 I must give the watercolours a re-visit soon as I have been rather concentrating on the oils. Even though I was meant to be sticking to the studio, I couldn’t resist taking my paints with me when I went up to get materials. This is the Strand the light was gorgeous. This needs a bit more doing to it but I might make a bigger picture of it. 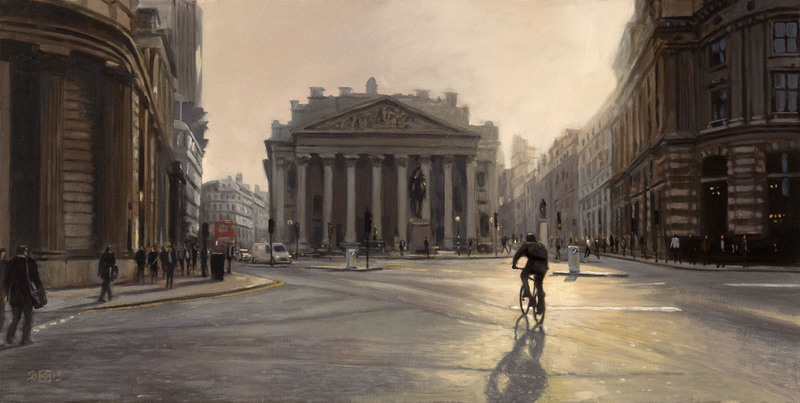 I want to do a few more in the way I did the Trafalgar Square painting mixing plein air and studio. 10in by 8in oils.